Nelson Bay Dining Out - Shoal Bay Accommodation. 5 bedroom holiday house with pool. Nelson Bay and surrounds. Dining out. 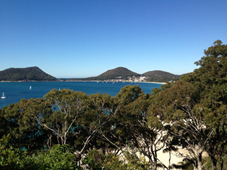 Only a short 5 minute drive from Shoal Bay. Spectacular location. Open Tues to Saturday for lunch. Long lunch on Sunday. Check out their website - click here. Baroque Restaurant & Coffee House. In the heart of Nelson Bay. Great coffee with unique decor. Open for lunch and dinner. Check out their website - click here. Open plan dining venue, nestled on the edge of d'Albora Marina. Seasonal menu offering fresh local food including seafood guaranteed to satisfy. Waterfront dining experience. Lunch 12 to 3pm. Dinner 5.30 - 9pm. Check out their website - click here. Dine on board ! Offering the perfect venue for your Port Stephens dining experience! Departs 7pm all year round. Fully licensed. Spectacular views! Live entertainment, sumptuous buffet dinner. Two and a half hour dinner cruise. Check out their website - click here. The freshest of seafood cooked well. Highly recommend food here. Spectacular views across the Bay. Spectacular views. Open 7 days 10am to 4pm. Serving hot & cold food, cakes, gluten free cake & breads, Quiche, Veg lasagne, crepes, salmon patties, soups, hamburgers, turkish melts, fresh sandwiches and scones. BYO welcome, group reservations welcome, open most public holidays. Please note - no credit card facilities. Cash only. Check out their website - click here. Make a booking enquiry for Shoal Bay Riggers NOW!